This is a comfortable, free standing vacation house built up against a mountain. You arrive on the terrain through a driveway. The mountain slopes down steeply besides the path (keep your eye on the little children). The terrain is not that large, but that is in no way a disadvantage. Because you will enjoy a lovely terrace with shaded trees, outdoor furniture, two sun beds and an electric barbecue where you will undoubtedly spend a lot a time, all the while enjoying the phenomenal view. 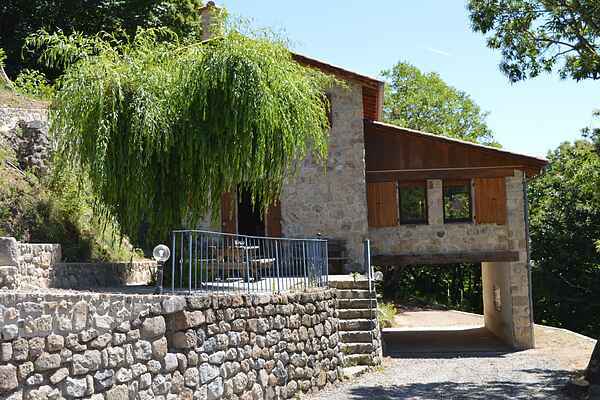 This gorgeous and completely renovated house is situated in the midst of nature, at approximately 3 kilometers up the mountain from the village of Burzet. This of course guarantees that you'll have a splendid panoramic view of the densely forested mountains. The only passerby every once in a while are the shepherd with his goats and sheep. You can hike directly from the house into these gorgeous surroundings. Although we suggest to take the car every once in a while. To begin with, make a visit to the waterfalls of Ray Pic (10 km) and the Mont Gerbier de Jonc (20 km), both offering fantastic views. Or what about visiting the medieval village of Meyras (15 km)? For the children there is an adventure park in Jaujac (15 km).